The cast of Weight of Water. Nine days after Hurricane Katrina, two rescue workers wash up on the doorstep of a woman by the name of Pearl Haynes, wreaking more havoc than any force of nature can conjure. As these lives collide, all of the faith that she can muster and all of the Bible that Pearl can quote can no longer distance her from her haunted past. The world premiere of Myra Slotnick’s new play, The Weight of Water, opened in Provincetown (the "Birthplace of the American Drama") at the Provincetown Theatre on October 6th, 2011 to much critical acclaim. In November of 2012, the entire original cast appeared in a staged reading of the play at The Abingdon Theatre in NY. The upcoming New York production features the original cast and creative team from The Provincetown Theater production. The cast stars, New York based actors Geany Masai* (A Play About My Dad, Off-Broadway, 59E59) and Jamie Heinlein* (Penny Penniworth, Off-Broadway) as well as Cape Cod actors Andrew Clemons (Our Town, Cape Cod), Linda Daniels (Women of Motown), Jimi Little (The Jazz Funeral of Stella Brooks, Cape Cod) and Keith Amato (Blue Bloods, CBS). The creative team includes, set design by Ellen Rousseau, lighting design by Mike Steers, costume design by Karen Billard, sound design by Jeffrey Billard and production stage manager Ashley Warren*. All performances take place at The Producers Club, 358 West 44th Street, between 8th and 9th Avenues. Subways A/C/E/N/R/Q/1/2/3/D/F to 42nd Street. *This is an Equity Showcase Production. Myra Slotnick (Playwright) is a member of the Dramatists Guild and is an award-winning playwright whose work has been produced across the country. Most notably, Songs My Brother Sang (Cape Cod Theater Project) The Last Thing (Provincetown Tennessee Williams Theatre Festival) and Forget Me Not (Mergatroyd Productions, NYC). 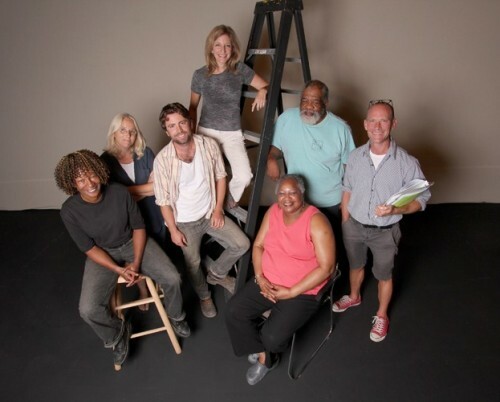 Ms. Slotnick's world premiere of The Weight of Water at the historic Provincetown Theater garnered six awards, including Best Original Script and Best Production at the 2012 Peer Awards. David Drake (Director) is an actor, writer, and director. 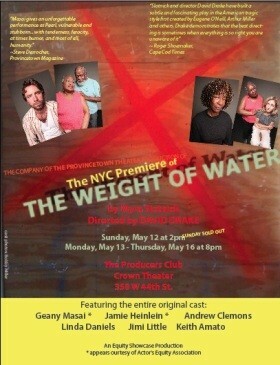 He staged the critically acclaimed 2011 world premiere of The Weight of Water for the Provincetown Theater. Twice chosen as a Directing Fellow at the Sundance Theater Lab, other directing credits include: The Beast of Taylor Mac (Public, Yale, Edinburgh), new plays in NYC at Rattlestick, Theatre for the New City, NYC Fringe Festival, and the world premiere of The Lily’s Revenge at HERE, which made the “10 Best Lists” of the The New Yorker, Time Out/NY, New York Post, The Advocate, Paper Magazine, and won a 2010 Village Voice Obie Award. As a playwright/performer, David is best known as the Obie Award-winning creator of one of the longest-running solo shows in New York theater history, The Night Larry Kramer Kissed Me. Most recently in NYC, David debuted Tawny, Tell Me True at the Laurie Beechman Theatre, directed by Robert La Fosse. Other off-Broadway credits: Pageant (original cast), Language of Their Own (Public), Boys in the Band (Lortel), Vampire Lesbians of Sodom (replaced Charles Busch, 856 performances), among others. TV/Film appearances include: “The Good Wife”, “Law & Order” (repeat offender), Longtime Companion, It’s Pat, and Jonathan Demme’s Academy Award-winning Philadelphia. This spring, David appeared in the world premiere of Ryan Landry’s “M” at the Huntington Theatre Company in Boston.